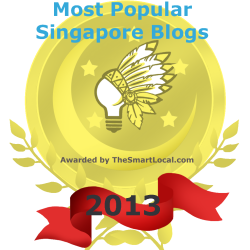 This is a five-part series of articles written by Leong Sze Hian and me. This article was originally published on The Online Citizen. Focus on Healthcare is a five-part series that provides a critical analysis of Singapore’s healthcare system, popularly known as the 3M system (MediShield, Medisave, Medifund). Through it, we hope to provide an understanding of how healthcare financing is currently being funded and used in Singapore, and explore the ways in which this can be further enhanced to cater for the needs of Singaporeans. 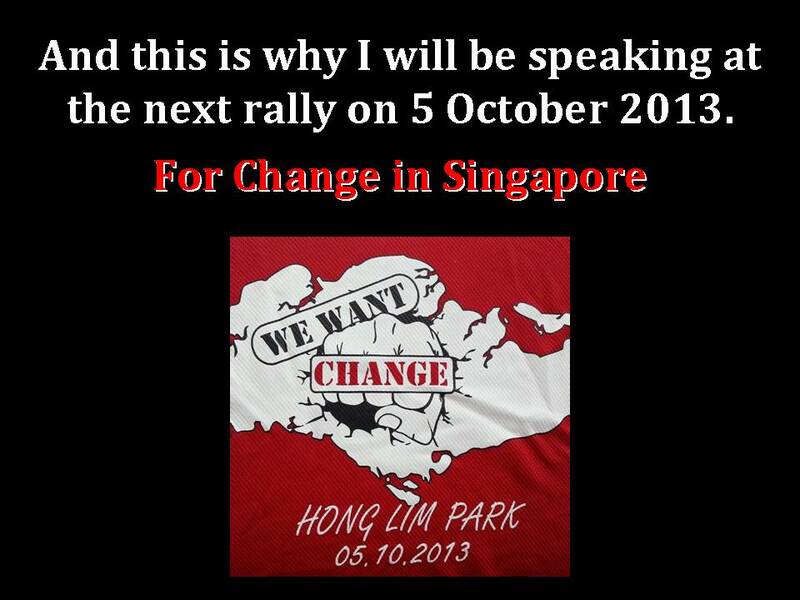 In this first part, we leap off from the Prime Minister’s slew of proposals announced at the National Day Rally 2013, and examine if the government’s current goal of providing “universal” healthcare might be off the mark. 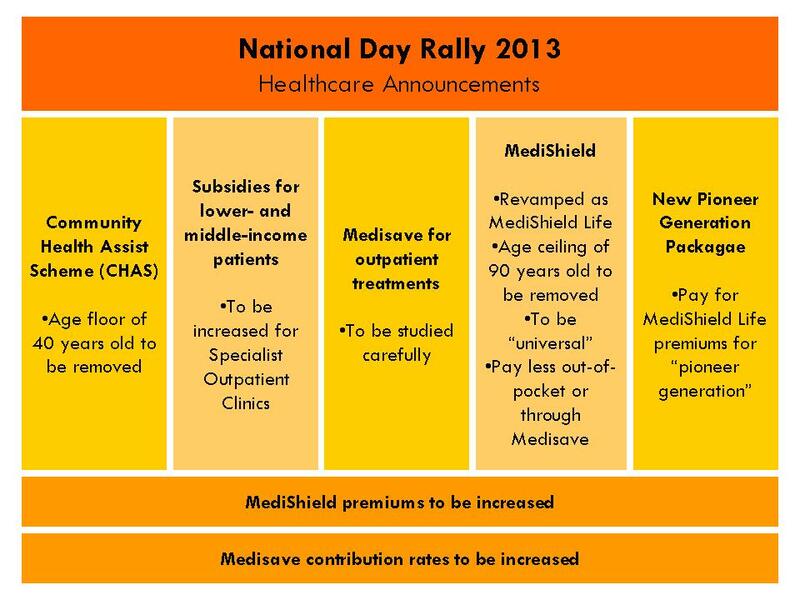 At the National Day Rally 2013, Prime Minister Lee Hsien Loong announced that healthcare financing will be improved to “give all Singaporeans more peace of mind.” A number of tweaks to the 3M system (MediShield, Medisave, Medifund) were outlined, and more information provided for in the weeks that followed. A number of important and useful tweaks were proposed. 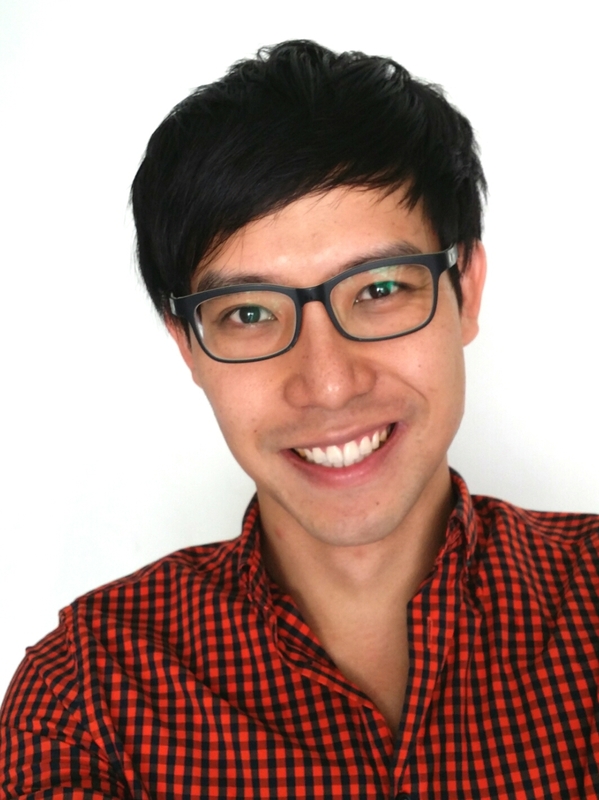 First, the age floor of 40-years for the Community Health Assist Scheme (CHAS) will be removed so that “younger Singaporeans will also be able to join the CHAS scheme”. Second, subsidies for lower- and middle-income patients who visit Specialist Outpatient Clinics will be increased. Third, the government will be “studying carefully” how to extend Medisave to be used for outpatient treatments. A Pioneer Generation Package will also be introduced to help pay for the MediShield Life premiums of older Singaporeans who belong to the “pioneer generation”. MediShield will also be revamped as MediShield Life, where the age ceiling of 90 years will be removed and “cover you for life”. PM Lee declared that MediShield Life “will be universal”, and will “cover everybody, every Singaporean, old ones, young ones, those newly-born”. He also said that MediShield will allow patients to “pay less out-of-pocket or out of their Medisave”. But exactly how comprehensive is Singapore’s current healthcare coverage? Does it provide assistance to everyone, and is the assistance adequate? Exactly how “universal” is the 3M system? However, following a parliamentary question raised by the Worker’s Party’s Gerald Giam in May 2013, we now have a deeper insight into the health expenditure of these funding sources over the last 10 years. 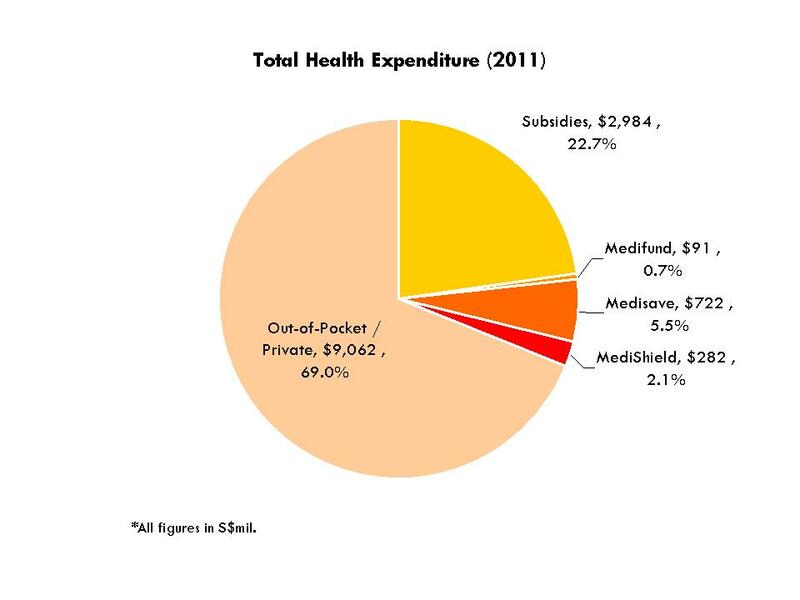 According to these figures provided by MOH, it would appear that in 2011, government subsidies accounted for only 22.7% of total health expenditure. This is much lower than the more highly publicized “80%” figure. 22.7% is a better reflection of healthcare expenditure, as it accounts for inpatient and outpatient treatments, general practice visits, private specialist care as well as care in restructured hospitals. In other words, the 80% subsidy is restricted to inpatient hospitalization and some outpatient treatments only for the small proportion of patients who meet the means testing criteria for highly subsidized medical care. The reality is that while inpatient hospitalizations are high profile expenses, the bulk of healthcare expenditure is often outside of acute care hospitals. Also, the statistics further showed that Medisave had accounted for only 5.5% of total health spending, MediShield just 2.1% and Medifund at an even more minuscule amount of 0.7%. Although PM Lee said the MediShield scheme is “universal”, it might be difficult to justify the “universality” of the scheme as being so, since it had only foot a marginal 2% of the total health spending. In PM Lee’s context, MediShield might be “universal” because “everyone” will now be required to pay into the scheme, but whether there is adequate coverage for each and every Singaporean is another matter. Everyone might be covered, but for some, perhaps inadequately. While the 3Ms are considered to be the pillars of Singapore’s healthcare system, these “pillars” prop up only 8% of the total health expenditure. Together with the subsidies, they make up only 31% of total spending. Meanwhile, Singaporeans are made to pay for 69% of the spending either by themselves or through medical benefits provided by their employers. One might find it ridiculous that such a small proportion of an average Singaporean’s healthcare is paid for by the 3Ms. Indeed, while policyholders are able to make claims to MediShield of up to $70,000 annually and lifetime claims of up to $300,000, only 92 policyholders had reached the annual claim limit and only 11 had reached the lifetime claim limit – which makes up less than 0.1% of the total number of MediShield policyholders. Also, to apply for Medifund, applicants would need to undergo the tedious and cumbersome processes of submitting numerous forms and income statements of all their family members as well as their own personal documents. From anecdotal evidence, many applicants have been put off from the process and chose to give up accessing healthcare, rather than receive financial assistance. If this is the case, the Medifund system can be easily overhauled to allow for automatic payouts to patients who meet the Medifund requirements, rather than for them to have to go through lengthy processes and waiting times to receive Medifund assistance. Why has this not been done? Clearly, the government’s low contribution to healthcare expenditure coupled with a highly onerous claim system that further inhibits this expenditure hardly makes the 3M system “universal healthcare”. Even as we look forward to the tweaks proposed by the Prime Minister, there are fundamental issues of government co-payment and claims processing that need to be addressed. Stay tuned for part two, where we examine the proposal by the government to raise taxes to fund the tweaks to 3M – is it absolutely necessary? I never liked the fact that govt is keeping taps on our earning, locking it down to impossible age to get what we worked for. Focus on Healthcare – Part 2: Where did our money go?